When you finish a can of soda or a bottle of water, where do you throw the remains? 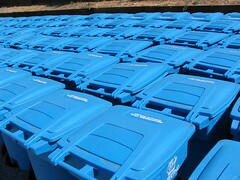 Does the container go in the trash can with the rest of your garbage, or in its own separate container for recycling? The answer should be the latter, and if it's not, then you should really reconsider your disposal methods. Recycling can never do any harm, and in fact, here are 6 reasons why it's a great idea to separate out those plastic, aluminum and glass containers from the rest of your trash. Probably the most obvious benefit, recycling is the best thing you can do for the environment. Studies show that nearly 60% of your garbage that you throw away on a daily basis can actually be recycled, otherwise it ends up in landfills where it's left to decompose to nothing. Problem is, it takes forever for recyclable materials to decompose, so all they do in the landfills is take up space where other garbage should be going. By keeping your recycling products out of the landfills, you're leaving more space for your actual garbage, keeping extra garbage off streets and sidewalks. It will also take less energy to recycle an old product and use it for another purpose than it would to create a new product for the same purpose, so recycling saves energy. Think about if you were to use every container you're done with over and over again for different purposes. It makes sense, right? Maybe you finish a jam jar one day, and you need to store some leftover soup the next day. If you saved your jam jar, you can save yourself a trip to the store for some Tupperware by just using the jar you already have. If you buy bottled water, think of other things you can use the bottles for before you throw them away. Maybe you drink 1 case of bottled water, then purchase a filter for your faucet or a filter pitcher and continue to refill your empty water bottles for several months following their purchase dates. You can also do all kinds of fun arts and crafts with kids using recycled products. Kids can figure out some of the most creative things to do with recycled bottles, so instead of having to go out and buy extra arts and crafts products, use what's already in your recycling bin next time your kids have an itch to craft. We've all seen the little 5 cent deposit for can return messages on the sides of our bottles and cans, but how many of us actually collect up our containers and take them to a recycling center to redeem our change? A few cans or bottles can really add up to a good payout! Start collecting now! Create bins to store all of your recycled containers in, and twice a year take the contents of the bins down to your nearest recycling center to deposit them. You'll be surprised how quickly the change adds up - depending on how many recyclables you collect, you could end up walking away with up to a couple hundred dollars! Recycling is probably one of the easiest things on the planet to do. All you have to do is be conscious of what you are throwing away. Before you toss something in the trash, think to yourself, "Could I actually recycle this?" If the answer is yes, sort it into a recycling pile. Recycling trucks come back just as frequently as garbage trucks, so it's really no hassle for you to collect your recyclables and bring them down to the curb every week just like you would your trash. The next time you go to throw an empty container away, think of all of the other things you or someone else could be doing with it, and seriously consider starting a strict recycling routine.